In the very slow process of refurbishing all the parts of our C-U Blogfidential whole, one dimension that has been unduly static for some time is our YouTube channel, a bit unsurprising since it is off-site and easy to let slide. We have started considering how to revitalize it but will probably have to wait until next year to give it our overdue attention. Until then, we still have the video sights to show you, dearest readers! 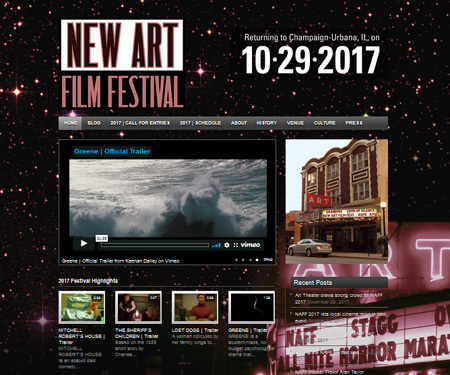 Given that we are close to entering our organizational season for the ninth annual New Art Film Festival, we decided to get back into the mindset by creating a NAFF-branded YouTube account that can serve as a window into our past shows for new fans and refresher for ongoing supporters who want to revisit their favorite pieces. Click this link to visit the channel and mull about; we gave it a “soft opening” last Monday, May 28, and will more heavily promote it through NAFF avenues once we get closer to the upcoming iteration. Of course, we realize that at first glance it may seem redundant to what we set up previously, but one has to remember the NAFF material is based on submissions versus the purposely broader swath cut by its C-U Confidential counterpart. 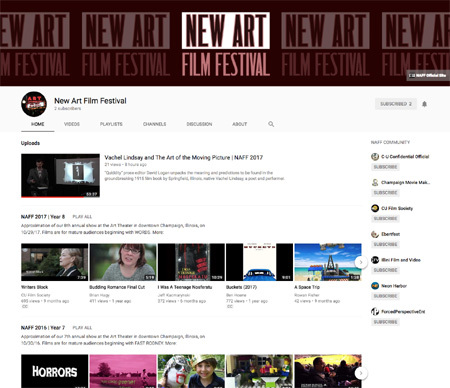 While assembling the new channel over the past two months, we have learned that most NAFF picks that do not appear on YouTube most certainly reside on pseudo-competitor Vimeo so, naturally, we are in the process of curating again so we can avoid leaving out filmmakers over platform preference. While the very nature of the effort is to aggregate what others have uploaded for themselves as exemplars of what can constitute local film production, we may be inspired to add our own media if the opportunity presents itself. That said, check back with CUBlog shortly to read about our first original NAFF video! This entry was posted on Monday, June 4th, 2018 at 8:00 am	and is filed under Area Festivals, Public Events, YouTube du C-U. You can follow any responses to this entry through the RSS 2.0 feed. Both comments and pings are currently closed. 14 distant relations of Jan Tschichold dissected this page in 0.321 seconds while exacting sweet revenge in silence.